Mechanical Seals – What are they and what causes them to fail? In a centrifugal pump, the mechanical seal (referred to as the “shaft seal assembly”) prevents the water that is being pumped from entering the bearing housing of the pump or simply the area between the motor face and the volute where the shaft passes through. This is not the same seal as the motor lip seal (or wiper seal), a part of the hydraulic motor that seals the motor shaft at the motor face and prevents any liquid from entering the hydraulic motor. A picture is worth 1,000 words right? 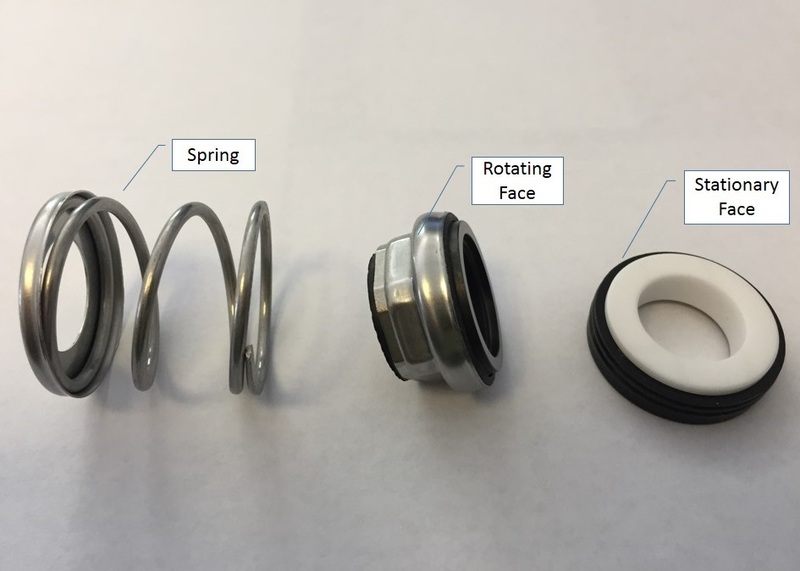 You can see the different pieces of a mechanical seal, in the picture below – in this case a carbon ceramic seal that would be used in a number of our smaller pumps. It is called a mechanical seal because there are two halves of the seal with flat faces that are pressed together by a spring. 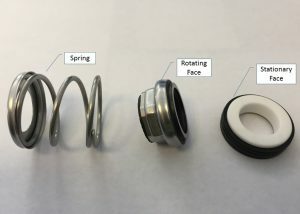 A spring presses the primary ring (or rotating face) against the stationary face – the primary ring spins with the shaft and impeller, the seat or stationary face doesn’t move. Tiny amounts of liquid pass between but are typically vaporized by the heat of the shaft and seal before even getting past the mechanical seal – this liquid is actually important to the mechanical seal as it provides both cooling and lubrication. The motor lip seal and the mechanical seal are the heart and soul of any submersible pump. In another piece we covered the causes of a motor lip seal failure – here we are going to cover the possible causes of a mechanical (or shaft) seal assembly failure. Some are simple and obvious, some might surprise you. Mechanical seals do wear out over time. Friction, heat and other factors contribute. Improper installation. If the mechanical seal is replaced and the new seal is not properly installed, this can lead to a quick failure of your new mechanical seal. Motor lip seal failure. If one of the many situations (see “What happened to my Motor Lip Seal” article 4/13/17) that can lead to a motor lip seal failure occurs, the bearing housing will fill with pressurized hydraulic fluid and push the stationary seat out of its recess (it will likely dislodge the rotating piece as well) and cause hydraulic fluid to flow into the volute. Debris in your pump. Something as simple as a plastic garbage bag or piece of rope can wrap around the pump shaft and compress the mechanical seal spring and jeopardize its function. Something like a long bolt with the strength to lock up the impeller can also have a detrimental effect on the mechanical seal. We will follow up this post with one that covers some of the material choices available in mechanical seals and the pros & cons involved with those materials.